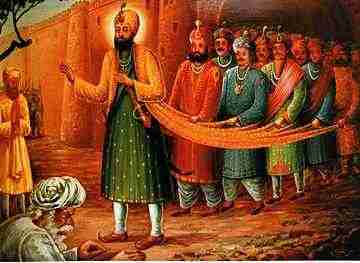 Bandi Chorh Diwas is a day on which Guru Hargobind Sahib was released with 52 Kings from Gwalior Prison. The word "Bandi" means "imprisoned", "Chhor" means "release" and "Divas" means "day" and together "Bandi Chhor Divas" means Prisoner Release Day. Bandi Chorh Diwas and Diwali are separate festivals and the events actually fall on different days; however, commonly in the popular calendars, they are celebrated on the same day. For this reason, many people often think of these events as if they are the same. In real terms, the day of release of the sixth Guru with the 52 rajahs (kings) was actually a few days before Diwali in 1619. These two celebrations represent two quite different events in history. On Bandi Chorh Diwas, the long imprisoned Guru Hargobind was released from Gwalior, taking with him 52 long imprisoned Rajas, whose release was a result of the Guru's wit. Diwali was being celebrated on the day when the Guru reached Amritsar. On the arrival of the Guru in Amritsar, the people lit up the whole city with thousands of candles, lights and lamps like they had never done before; there was much celebration and joy. Bandi Chorh Diwas falls on the night of Amavas in the month of Assu; this actual Bandi Chorh Diwas is celebrated each year at Gurdwara Data Bandi Chor Sahib, Gwalior with much gaiety and joy, a few days before Diwali.